Small, globular, sandy-coloured. Unlike any other crab, uses broad oval patches (tympana) on legs to absorb oxygen from air. Tympana were once thought to act like ear-drums. To 12 mm across. Wave-exposed and estuarine sandy beaches, intertidal. 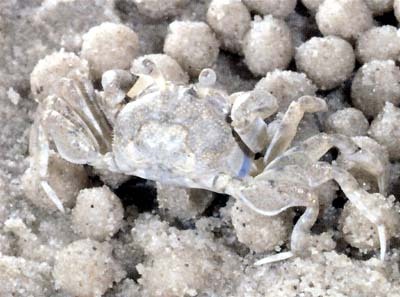 Makes distinctive patterns of small, sand balls radiating away from burrows (the result of feeding and ‘house-keeping’ activities). Indigenous, eastern Australia.